Hip dysplasia: What are the signs, symptoms and treatment? I spent a week with a baby who wears a brace for hip dysplasia, and I’ve come to the conclusion that we aren’t giving some babies, or more importantly their parents, the reaction they deserve. Doctors and nurses: Who to trust when it comes to treating your baby? The most common reaction I witnessed was sympathy: sorrowful sounds like “aww no …” matched with a sad look on their face as if the eight-month-old had four legs (which is actually considered a blessing in Hindu culture). Then they would ask if she “is she okay?” or say things like “poor bubba”, which I didn’t get because she looked really happy to me? The worst exchange I witnessed was when a lady walked up to my friend and asked: “what’s wrong with her?” My friend said, “nothing is wrong with her; she has hip dysplasia,” to which the lady responded, “I thought only dogs got that”. I could not believe the ignorance or lack of tact I had just witnessed, and as much as my friend laughed it off, I could see the hurt in her eyes. One of the hardest things for parents is dealing with a lack of awareness. Since little PK’s diagnosis, she has had to wear a brace 23 hours a day. PK can’t roll, sit up or move all that much unassisted and a consequence has had trouble with doing ‘number twos’ and sleeping. As well as putting up with unwanted sympathy, tactless questions and staring, my friend had to buy a different car seat, baby carrier and high chair. She’s also had to modify her pram, bumbo, play equipment, clothing and breastfeeding position. The next time you see a baby wearing a brace, you could comment on the brace, or you could marvel at her divine cuteness as you would do any baby. No sympathy, no alarm, just show her parents you are gushing over the gorgeousness of their baby. Because all babies, and their parents, deserve admiration and gushing from strangers, regardless of what position their hips are in. So what is hip dysplasia and what are some of the signs and symptoms? 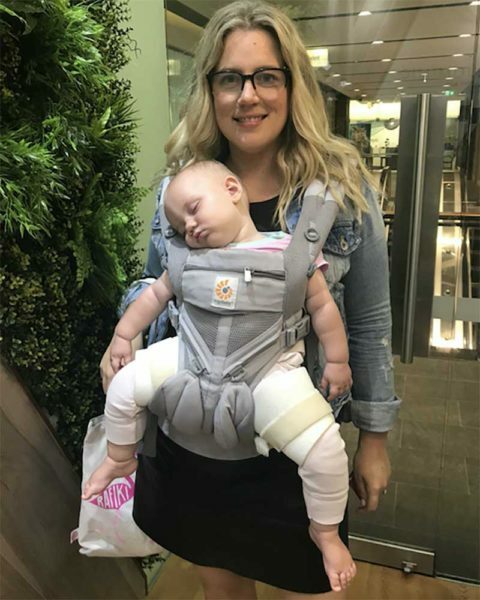 Nicole Williams, Board member for Healthy Hips Australia and Head of Orthopaedic Surgery at the Women’s and Children’s Hospital in Adelaide explains. Hip dysplasia is the medical term for a hip socket that doesn’t fully cover the ball portion of the upper thighbone. In some instances, the hip joint may become partially or completely dislocated. Approximately eight children a day are diagnosed with hip dysplasia in Australia. However, most people don’t know about the condition until their child is diagnosed. If it isn’t picked up by a medical professional when your child is a newborn, you might notice later on that the skin creases in the backs of your baby’s thighs are uneven. 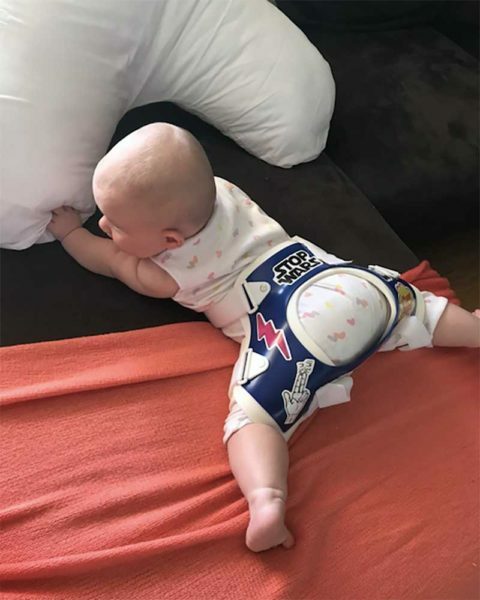 Or when you’re changing your child’s nappy, you might notice a ‘clunk’ sound in the hip, or that one thigh looks shorter than the other or doesn’t seem to move as far out or as easily as the other. If hip dysplasia goes undetected, a child’s leg could either appear to be in an abnormal position or be shorter than the other. Additionally, your child might walk with a limp or with her their pelvis tilted to one side. Please note the presence of these symptoms does not necessarily mean your child has hip dysplasia. Further evaluation with your GP, paediatrician or a child/maternal health nurse is recommended. The most common treatment for hip dysplasia is bracing a baby in such a way so that her hips are kept in a better position for hip joint development with the goal of influencing the natural growth processes, so a more stable hip joint is developed. In some cases, a body cast or surgery may be required. If this goes undetected and untreated in childhood, hip dysplasia can continue to damage the joint over the years and is a leading cause of hip pain and arthritis in young adults, which may eventually require a hip replacement. Although hip dysplasia isn’t life-threatening, it can be life changing. When I see my friend forging through the discomfort and frustration PK is experiencing, and all of the additional work and admin she has to put in for simple tasks like a nappy change, I can see it’s hardest on the parents because ‘hip kids’ are so resilient. But parents are doing the best they can to help improve their kid’s health in the long term – and that is something to be admired, not pitied. For more on relationships, motherhood and the sisterhood, catch PodcastOne series “The Queen Sesh Overshare” with Constance Hall and Annaliese Dent on iTunes. You can hear more from Annaliese Dent on Facebook or Instagram.